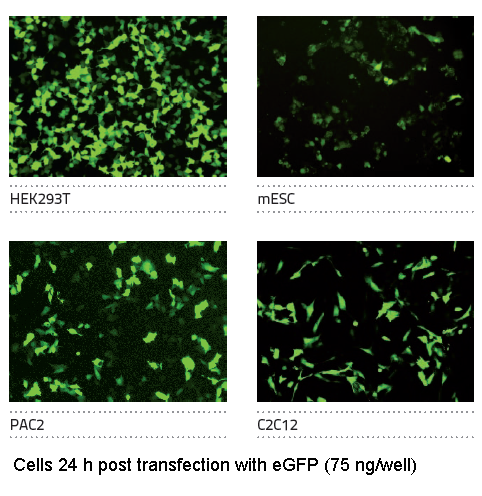 ScreenFect®A is a multipurpose transfection reagent for pDNA, siRNA and mRNA delivery, and for cotransfection into a broad range of cell lines including HEK, HeLa, Mef and primary cell lines. ScreenFect®A is serum compatible and free of animal derived components. It has relatively low cytotoxicity, allowing easy One-Step cell transfection of recently detached cells. This One-Step procedure reduces the duration of your experiment by one day. Once diluted, ScreenFect®A can be used for a period of up to four days. A dilution buffer is included with the reagent.